RKO General Broadcasting had a challenge when it debuted its new FM rock station in 1966: Selling it to advertisers. Consider that this was a radio station on a band (FM) that few people were taking seriously. It didn't have the range of AM, the radios were not particularly good, its new rock format had a far different sound and the call letters were branded to much different format (WOR-AM). The idea of "niched broadcasting" was unheard of. There were strong headwinds to overcome. In this environment, RKO tried to sell its new radio station to prospective advertisers. First and foremost, they called the station "OR-FM". Not WOR-FM. The idea was to distinguish it from its stodgy (and immensely successful) AM sister station. Imagine trying to convince a youth audience that this "WOR" is not going to sound like "Rambling With Gambling"! Next, they did what any good salesman does. They emphasized the positives. With that in mind, a promotional package was assembled. 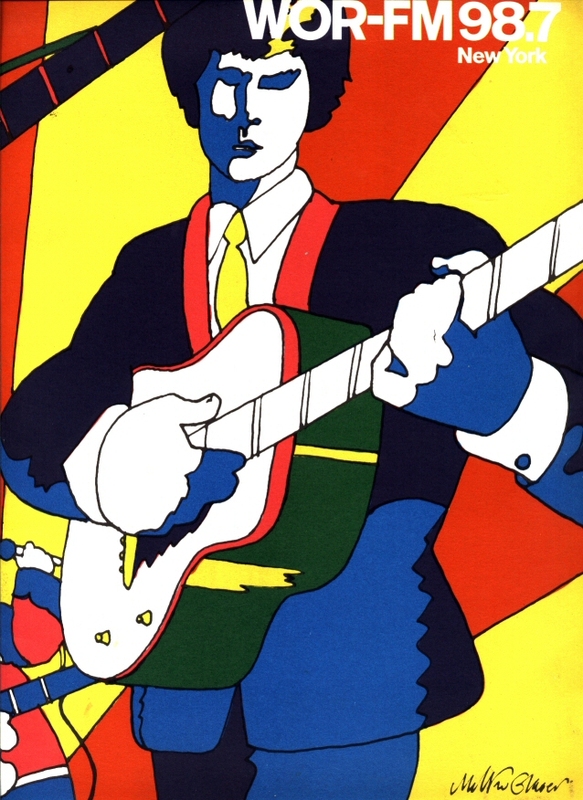 The artwork is from Milton Glaser, a well known graphic designer and illustrator. 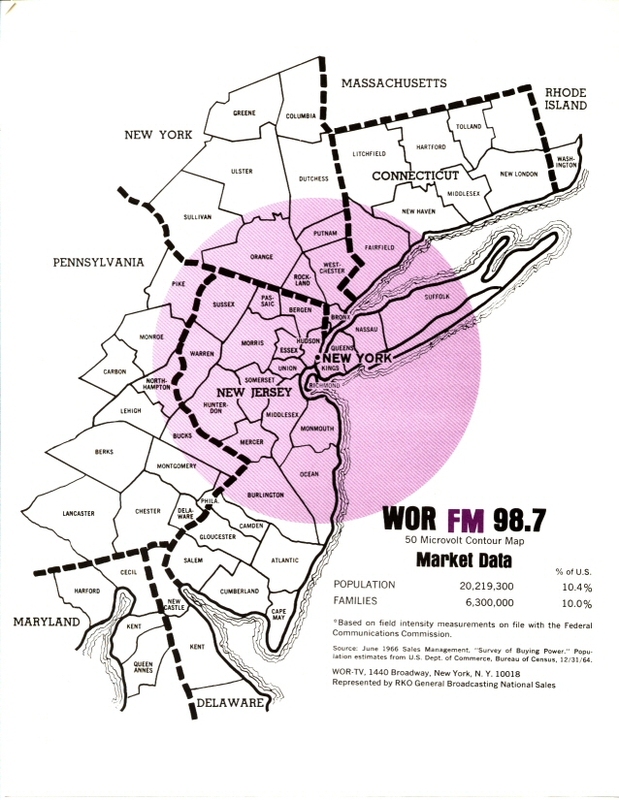 WOR-FM used the full version of this image on all of its promotional materials during that first year. It set the tone for the station and gave it an image. 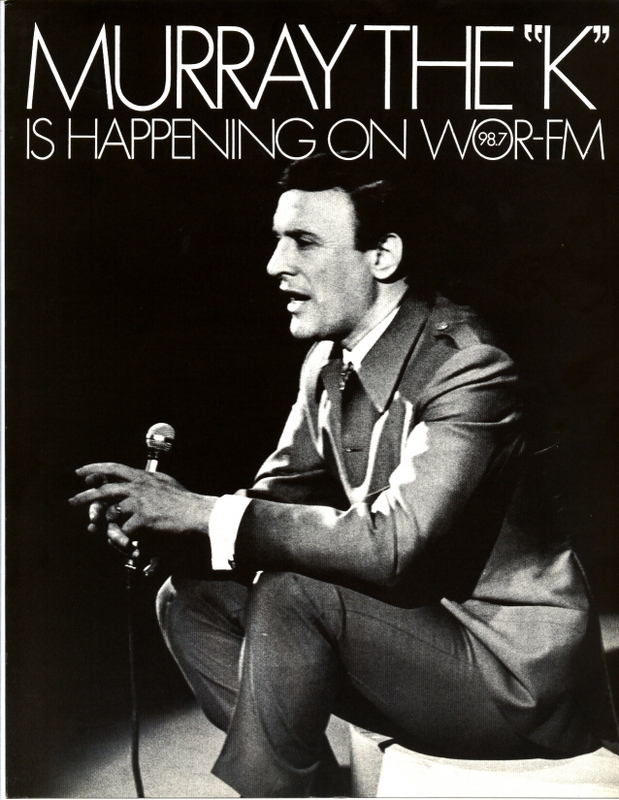 Murray was WOR-FM's biggest selling point. Prior to WOR-FM, he was best known from Top 40 WINS. He was a bona-fide radio star, well known to advertisers sometimes referred to as "The Fifth Beatle". Advertisers like names they know and want to be associated with. 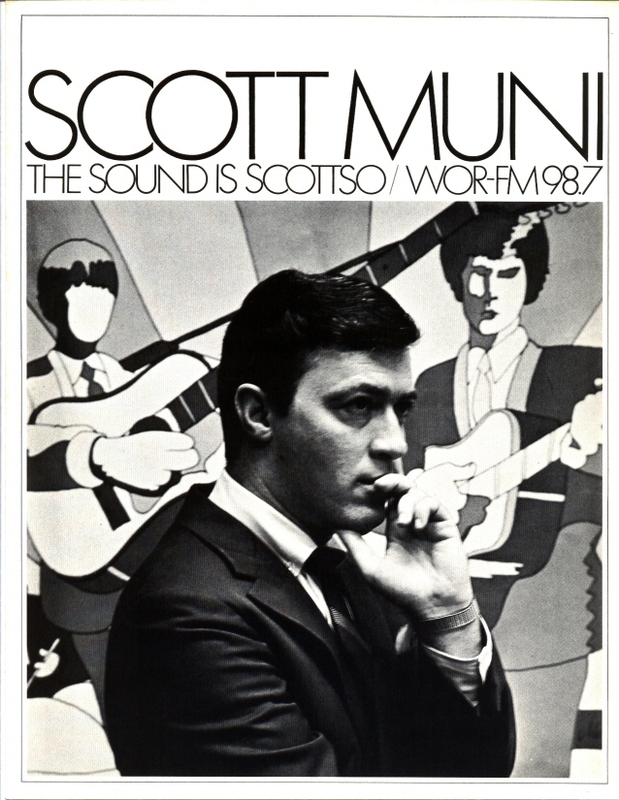 Scott was also a well known radio personality primarily from WABC. As with Murray, he gave credibility to the station. Even in his Top 40 days in "Scottland's Yard" his unique voice and style appealed to advertisers. The station was trying to demonstrate it could be received beyond a few miles. At the time, convincing the public that was possible on FM wasn't easy. This coverage map is very generous... for 1966! 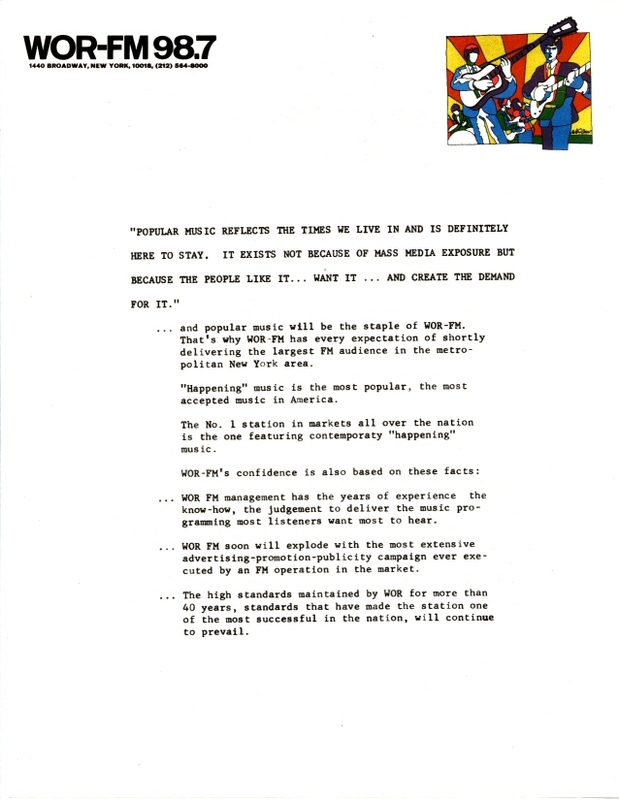 RKO emphasized to advertisers that it was going to play "Popular Music". You don't see the words "rock" or "progressive". The only indication that this is a youth station is the word "happening". They also noted management's "years of experience" and the "high standards" of the WOR Brand. RKO was trying to convince prospective advertisers that they were going to heavily promote the station. Remember, this was a new station on a relatively obscure frequency. Reassuring a prospective advertiser that there would actually be listeners was a challenge. If so, you could get in on the Charter Plan for this new radio station. Note how Murray The K's advertising rates were higher. 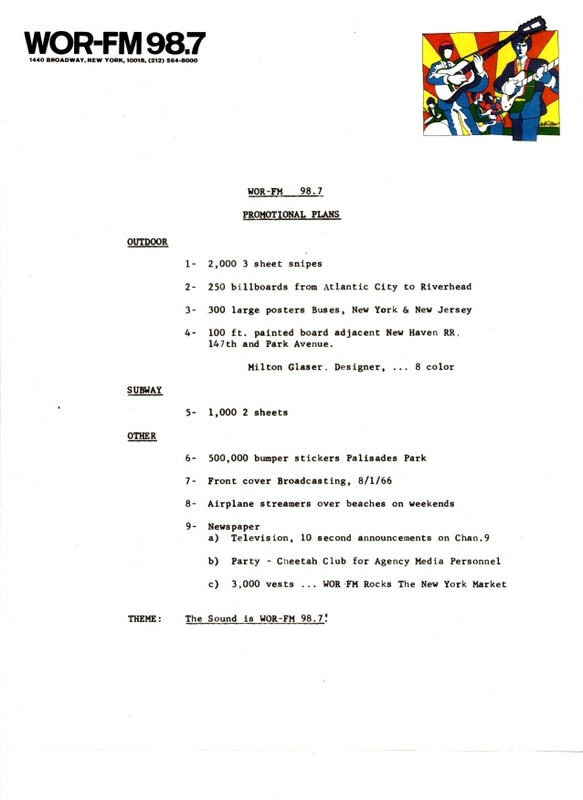 What is interesting about these materials is that it's clear RKO had no idea just what WOR-FM's strengths would be. It would turn out that its progressive rock format was a huge hit to younger rock radio listeners. On college campuses, it was the single most popular station and its ability to sell new recordings was unmatched. It was, indeed, the first niched radio station. As Metromedia's WNEW-FM went on to prove in the years that followed, the concept of an FM rock station that plays music beyond the hit list could attract a loyal and significant audience.